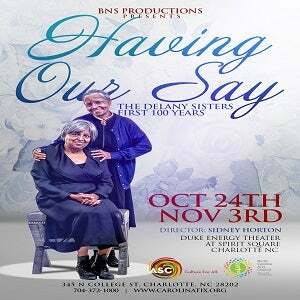 Trailblazers, activists and best friends, the Delany sisters—103-year-old Sadie and Bessie, age 101—take us on a “provocative and entertaining” (The New York Times) journey of triumphs over prejudice in times of social unrest. Celebrate the story of a century as lived by “two strong, vibrant women dispensing joy and wisdom” (Chicago Tribune) in this funny and heartfelt family drama based on the bestselling memoir. Groups of 10+ can receive 10% off tickets, not available on Wednesday’s performances. Please call 704-348-5752 to purchase group tickets.